An accountant or a pastor? Four years ago, Cody Warren came to Augsburg with the certain sense that he was called to become a pastor. A volunteer opportunity created in Cody a desire to learn more about tax accounting, and it also opened his eyes to new possibilities for exploring his vocation. 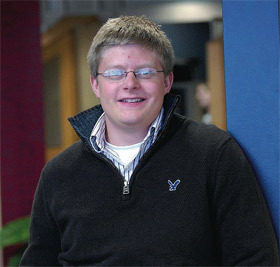 At Augsburg, Cody majored in Accounting and Religion, was involved with campus ministry, was an orientation leader, worked with academic advising, and was part of the Augsburg accounting and finance club. And in President Pribbenow’s first year, Cody got to trade places with him for a day. He says Pribbenow reversed all his decisions from that day.